Heavyweight front fabric 600 gsm, blackout lining 140 gsm, thermal, eco-Friendly cotton blend material. Eyelet grommet 1.6 inches inner diameter, 2.7 inches rim diameter. Fabric type: cotton polyester print. Feature: The curtain is lined with 140gsm blackout fabrice in beige to block the 95% of light. Thermal Insulation. To know more information for custom made order, please click "ChadMade" and review seller profile, then click "Help" section.. 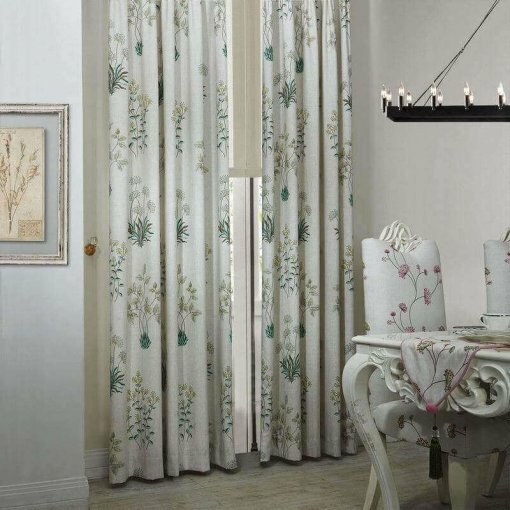 These are beautiful curtains. Seem to measure larger then indicated but they are working out great. Hi quality very heavy. Nice stitching and lining. I was surprised when they arrived much sooner than they were expected. Though a bit pricey, these curtains fit beautifully against my bathroom shower which is banked by a custom built cornice board. These curtains are the absolute BEST! I tried many off the rack curtains from Lowes/Home Depot/Home Goods and found them to be so thin and cheap looking when hung. The Chadmade curtains are the best purchase I made and I enjoy them every day.